This chair, of simple wood construction using surplus military webbing, was designed by Jens Risom for Hans Knoll, before Risom entered the Army during World War II. It was the basis for Knoll's first line of products introduced in 1942, virtually the only modern furniture available during the war in the US, and was patented in 1945. Jens Risom was born in Denmark in 1916, and arrived in the US in 1938. He worked as a textile and furniture designer with Dan Cooper in 1939, and in 1941 joined with Hans Knoll to produce modern furniture. After the war in 1946, he started his own design and manufacturing business, Jens Risom Design. 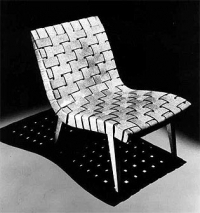 Hans Knoll (1914-1955) was born in Stuttgart, Germany, where his father was a furniture maker. Hans studied in Switzerland and England, and emigrated to the US in 1937 to establish his own business, the H.G. Knoll Furniture Company in New York, offering simple, modern furniture. In 1944, Hans married Florence Schust. She had studied architecture at Cranbrook Academy, the Architectural Association in London, and at the Illinois Institute of Technology under Mies van der Rohe. Hans and Florence established Knoll Associates in 1946, with the idea of creating a collection of furniture designs by well-known designers and paying them on a royalty basis. These included George Nakashima furniture, the Hardoy sling chair (1946), Mies van der Rohe's 1929 Barcelona chair (1947), Eero Saarinen's Womb chair (1948),Isamu Noguchi's cylinder lamp (1948) and Akari lamp (1952), Harry Bertoia's Diamond chairs (1952), Eero Saarinen's Pedestal chair (1956) , Mies van der Rohe's 1930 Brno chair (1960), as well as his 1927 Weissenhof chair (1964), his 1930 Tuganhat chair, and his 1930 Berlin leather couch (1964). This successful "designer and royalty" concept was imitated by many contemporary furniture companies. Florence Knoll's connections with leading architects and designers were essential to building Knoll's post-war interiors and furniture business, and upon the death of Hans in 1955, she served as President of Knoll Associates until 1959, when she sold her interests to Art Metal after her re-marriage to H. Hood Bassett. She continued as design director until 1965. In 1969, the firm became Knoll International, which was taken over in 1977 by General Felt Industries, and in 1990 by Westinghouse who again sold it in 1996. Later Knoll designs included Marcel Breuer's 1927 Cesca chair (1969), the Niels Diffrient Seating Series (1979), the Bruce Hannah Desk System (1981), Frank Gehry's bentwood slat furniture (1991), and the Orchestra desktop lamp which won an IDEA design award in 1992.